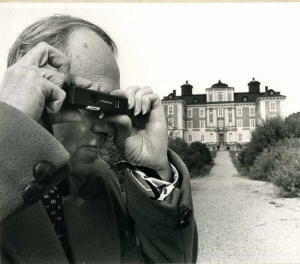 » Iwan Morelius on COLIN FORBES (1923-2006): Researching THE STOCKHOLM SYNDICATE. Iwan Morelius on COLIN FORBES (1923-2006): Researching THE STOCKHOLM SYNDICATE. As long back as I started to collect books I had as a habit to write to those authors I liked very much. 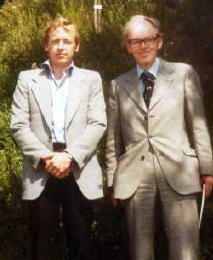 After a while they were many of them and among the earlier ones was Colin Forbes , well known thriller writer from England. The first thriller by him was in fact Avalanche Express, which turned out to be a smashing movie some years later. 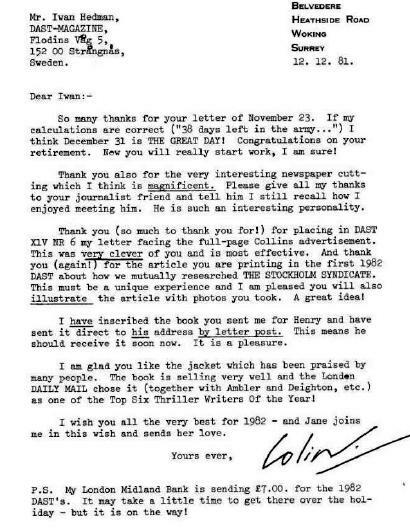 Colin was kind enough to answer my letters and we were pen friends for many years before he wrote me a letter telling me he was going to visit Sweden ( Stockholm) in order to make research for his next thriller. Wow, how exciting! Hopefully I should meet him in person. Of course! Colin asked me if I wanted to help him with his research. To that it was only one answer � YES! 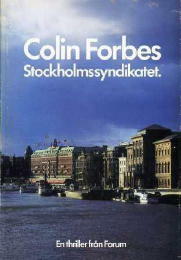 Colin and his wife, Jane, should come for one week in June 1978 and we met the first day he was in Stockholm at his Swedish Publisher�s office. The Publisher invited us for a lunch and there were Colin, Jane and the publisher Bertil K�ll and me, a captain in the Swedish Army. We had a nice � and very good tasting – typical Swedish lunch together and during it Colin informed me what he wanted for the research. 2. The second thing he wanted to see was a typical Swedish forest with giant trees. He had heard we had trees being as high as 30 meters. I suggested a place, which I had visited many times and found very, very exciting. It was situated in the middle of a forest and had once been used for mining. Still there were many deep (I mean really deep) holes and the fence was gone many years ago. Some people used the holes to put their old cars in). Colin inspected the place carefully and he was very satisfied with the place I had chosen. 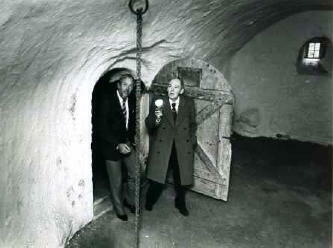 Colin and I deep in the cellar vaults. On our way to my home we took a little extra driving and found a place with the kind of trees he wanted (so far I didn�t know why he wanted to find them). Colin was very satisfied with his first day on his research. We drove to my home and had some tea and Colin inspected my library and he was especially satisfied with my collection of signed books by so many famous authors. At that time I had around 15,000 mystery books (Mystery/Thrillers and Science Fiction plus non-fiction in the genre). We offered Colin and Jane to stay over night but they refused. 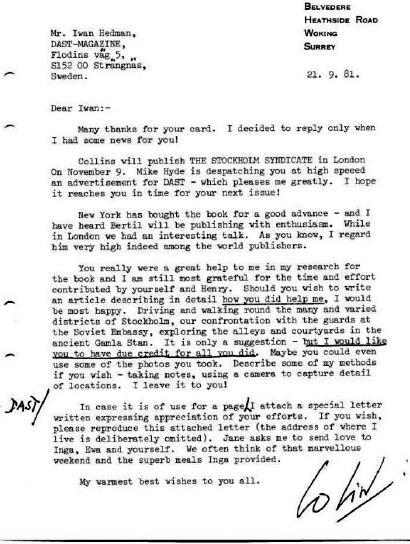 Colin wanted to work on his book and wanted to be in his hotel then, which I respected of course. So I drove them back to Stockholm and their hotel. Before I left Colin asked me if I knew someone who knew Stockholm on his five fingers, as we say in Sweden. Of course I did and I phoned my old friend Henry Augustsson, a goldsmith in Stockholm, who was more than happy to be of help. He was also a keen book collector. Next day we were outside the hotel very early and our first goal was the Russian Embassy, situated in the middle of Stockholm. I parked my car (a Volvo Station wagon) outside the Embassy and took out a big (large?) map and put it on the car. It took only two minutes and a special guard, not from the Embassy, but from a Swedish guard company who have guards outside every embassy in Stockholm. The guard told us to leave at once but we told him we would not. Henry and Colin outside the embassy. This is a common place where everyone who wanted it could stay or park his car. So we continued to study our map over Stockholm and make some notes and drawings when the guard disappeared. Henry, who knew what he was doing, told us he phoned the Swedish police. Before the police arrived we took our photos and waved goodbye to the guard � the �Dummy�, we called him. Our next stop was Djurg�rden (Animal garden, roughly translated), one of the most beautiful places in Stockholm with water, open places, parks and paths for walking etc. Colin wanted to find a luxury yacht for his book. And that was very easy to find here where the rich people in Stockholm had their yachts and big motorboats. Next stop was Kakn�s tower, a tower from where you could view the whole of Stockholm. I think it is around 60 meters height and on top there is a restaurant. Colin invited Henry and me for lunch. From the top we could see the V�rta Harbour, from where the ferries to Finland go and were also most of the oils are placed. Colin asked Henry if it was possible for a big Russian fright boat to anchor there. The answer to that was YES and Colin was satisfied again. Next goal was Stockholm�s The Old Town (Gamla Stan) where he could look at all those very old houses, walk in the narrow streets and also have a look inside the yards of the houses. We talked to some people who lived there and they showed Colin the use of the key locks (the coded ones). He liked that and told us it should be in the book. Colin was very satisfied with his day and asked us if we would like to join him and Jane for dinner at Grand Hotel�s French Veranda (a glassed veranda), from where we could have a nice look over The Str�men (the water between Grand and the Royal Castle). Another YES, of course! This was Colin�s first visit to Stockholm, but not his last and later on I was to be invited to their home in England (Woking, Surrey). * The Savage Gorge (n.) Simon & Schuster, 2006 [Tweed] Published posthumously. Note: Tweed is Deputy Director of the SIS, the British Secret Intelligence Service. SAWKINS, RAYMOND H(arold); see pseudonyms Jay Bernard, Colin Forbes & Richard Raine.